PHARMACEUTICALS AND HEALTHCARE: Indian pharma entrepreneurs always spot an opportunity! 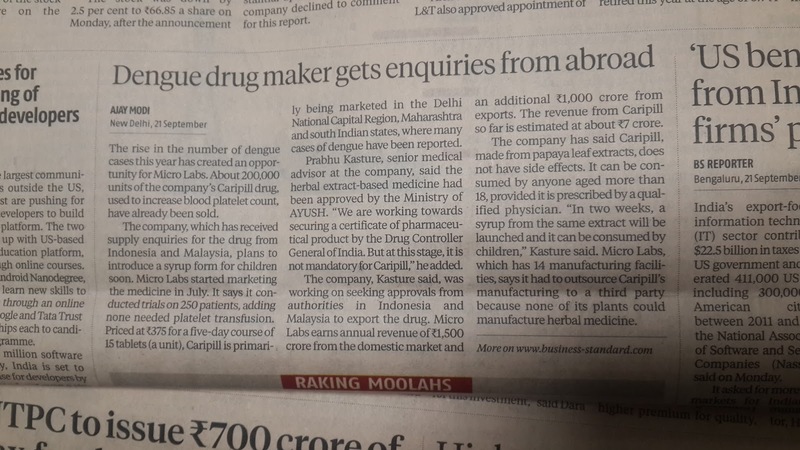 Indian pharma entrepreneurs always spot an opportunity! The above is a photograph of the report in Business Standard (22.9.15, page no. 2), highlighting the success of Caripill (an Ayurvedic formulation) for increasing platelet count in dengue patients. This product has started with a bang. In just two months, Caripill (from Micro Labs, Bangalore) has achieved Rs. 7.00 crores sales (Rs. 70 million), the market grapevine is that Micro Labs sales team of Rajasthan and Delhi achieved their sales target for Sep 2015 by 9.9.15 (ie., in nine days itself!). There are reports of business enquiries from S E Asian countries for importing Caripill. If this trend keeps up, it won't come as a surprise if Caripill hits a jackpot of Rs. 100 crores (Rs. 1 billion) in one rolling year! A blockbuster performance by the Indian yardstick!! 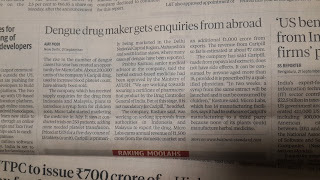 Kudos to this example of pharma entrepreneurship. Micro Labs is essentially a me-too branded allopathic formulation manufacturer and marketer. However, the zeal to succeed through entrepreneurship, is apparent through the above example, where Micro Labs has moved on to launch an Ayurvedic formulation, traditionally not their forte. They have leveraged their strength in marketing to astutely establish ayurvedic Caripill. Strides Arcolab, another Bangalore based company, having a spectacular global performance in nutraceutical and pharmaceutical (including injectables) contract manufacturing, is looking for breakthroughs in domestic pharmaceutical formulations market. Strides acquired Grandix Pharmaceuticals, Chennai, in 2007, and made their entry into the domestic branded formulations - pharmaceutical market. The idea was to increase their spectrum of pharmaceutical activities - and not just stick to their knitting of contract manufacturing. Strides Arcolab, is as aggressive as Sun Pharmaceuticals in its own way - by focusing in niche areas of global pharmaceutical business. A win-win deal was recently struck between Sun Pharmaceuticals and Strides Arcolab: the latter has purchased Solus and Solus Care divisions, these divisions market niche CNS drugs. Solus and Solus Care - are part of Ranbaxy - Sun Pharmaceuticals had made a historic purchase of Ranbaxy for 3.2 billion USD in March/April 2015, Sun now through this acquisition controls nearly 10 percent of Indian Pharmaceutical Market. This astute move by Sun to sell Solus/Solus Care is truly win-win with Strides. It gives Strides Arcolab an opportunity to add another niche therapeutic market, thus, concentrate on a high-tech niche area. Strides Arcolab is in fact, a niche hi-tech player. Strides Arcolab is strengthening its competency in biogenerics (biosimilars) manufacturing (Stelis division in India and Malaysia). Some of such new biogenerics are likely to be in the area of CNS disorders. Thus, Solus and Solus Care can be used as platforms to launch high tech, niche area, high value, high margin, branded biogenerics to the domestic pharmaceutical market by Strides Arcolab. For Sun Pharmaceuticals, which is already a very strong player in CNS segment, it does not make sense to have Solus and Solus Care, since Sun Pharma has a deep coverage of CNS drug prescribers. The point - less overlap between Sun Pharma and Solus/Solus Care will not expand market, it will only cannibalize the market for Sun Pharmaceuticals, hence it has happily shed Solus and Solus Care divisions to Strides (for Rs. 165 crores). This is truly exciting contemporary development in above vibrant pharmaceutical companies based out of Bangalore! This is a very informative and good stuff related to the pharma sector.